The delightful Romanian Mum is hosting this week, so pop on over and get those posts linked up for some Pinterest-y love! She also kindly explains the rules for those of you that haven’t taken the plunge and joined in before. We are here, and on five other lovely blogs, every Monday. So pull up a chair, grab some Pringles and join in with the party. All you need to do is seek out some of those Parenting related posts that you have written in the last week and add them to the blog hop. 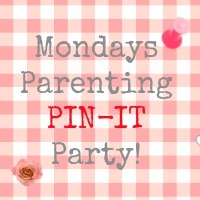 Then comment, share on Pinterest as explained in the rules, and you should be finding some great new tips, and wonderful activities for those little ones, and big ones that we love so much.